There's a lot of cyclical development in gaming. Games are made using the full power of a console, and as new iterations come out, more and more is added until the original seems nothing like the newest. If Final Fantasy XV was a "revival" of the NES-era series instead of an iteration through the years, or we had gone from Super Mario 1 to Mario Odyssey, we'd be shocked to think they belonged in the same universe. Sometimes, people yearn for the old days, which is why we get things like Bravely Default or New Super Mario Bros. While newer RPGs tend to aim for more action ever since the Active Time Battle system was introduced, there is a strategy mentality from the original RPGs that is lost. Crafting the perfect team to dominate fast-moving situations is a lot different than turn-based, where the game of chess dynamically moves depending on the results of the last round. The Alliance Alive is designed by a team of legendary game developers who are looking to return to those roots, and the resulting game hits all the nails on the head, while adding the polish available thanks to the lessons learned in the years since. 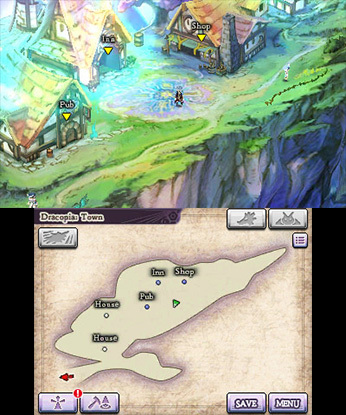 From the same company who brought you the Legend of Legacy on 3DS, The Alliance Alive tells the tale of a world that has been divided into regions by an impassible Great Barrier for so long that inhabitants of each realm see other parts of the world as myths. This Great Barrier was created by the Daemon race, who use the Beastfolk to keep the humans in submission. While the game sets you up to feel as if your first characters, Galil and Azura, are to be The Protagonists of the Game, you soon discover that you bounce to another realm on the opposite side of the Barrier. Slowly but surely, all the members of the Alliance come together, their stories intertwining. A random character you saw in a previous route turns out to be controlled in another. The ship that one troupe is searching for is piloted by a different set of characters. By the end of the intro, you have a situation where everyone is a main character, much like Final Fantasy VI. One of my favorite parts of the opening scenes is watching the lives intertwine before the characters even meet. Each group comes from different backgrounds, and may even oppose each other in core beliefs. As the story develops, they develop the need for each other's support. The story is straightforward, but fun and deeper than in Legend of Legacy. The artwork is beautiful, and very reminiscent of the Bravely Default series both in character models and world art. The sounds are beautiful, with swelling melodies and wonderful battle noises, but the developers did choose to have absolutely zero voice actors involved. A bit of an oddity, but true RPG fans won't be jaded by this, as they're used to making up voices for their team. There are a lot of options in The Alliance Alive that will keep a micromanaging nut very busy. There are three different ranks in your party formation, of which you can have up to five members in at a time. Frontline characters get a boost to their attack, at the risk of being attacked more themselves. Placing support-based characters in the back protects them while they heal your party. By and large, you are healed at the end of a battle, though your SP doesn't usually go up quite as fast. SP is used to dole out extra damage through special skills, dependant on what weapon you are using at the time. You can equip a couple different weapons on each character, and most everyone can use all weapon classes, allowing you to tailor the party as you truly see fit. There are no "level-ups" in The Alliance Alive, instead allowing the characters to grow more naturally. Using a weapon more often allows you to have an "Awakening" where you learn a new maneuver, or you might increase the strength of a particular move. At the end of a battle, your characters may gain a bit more HP or room in their SP meter. For those who miss traditional levels, you also gain Talent Points, which allow you to increase core proficiencies with particular weapons or abilities, making individual attacks cost less SP to activate. It feels like growing your team on Final Fantasy Tactics, where you save up for a particular ability. You don't see a lot of growth at once, but over time a few hit points/SP increases will make your character stronger, and it's very satisfying to save up Talent Points for that powerful ability. Later in the game, you can "seal" certain arts to make other ones more powerful. You also build Determination during battles, which will in turn open up a chance to use a Final Strike, sacrificing your equipped weapon to do massive damage. My biggest problem with the game would be the brevity of tutorials. I know we are overloaded on trainings and instructions these days, but at times they are needed. Final Fantasy 1 was simple enough to drop you in and say "go," but not so much for modern systems. There is a decent digital manual that is worth reading (and reviewing) that will help you make more sense of everything mentioned above, as well as the Guild Towers, special "radio beacons" of sort that will support you when in range. With the right work, you can build up the guild members, and receive the support of multiple towers, which will add defensive and offensive capabilities to your party when you are nearby. Also, near the beginning I was frustrated as the game would simply tell me to "go northeast" and that was it. The map doesn't have unknown locations on it, and if you aren't paying attention you might be left befuddled as to what to do next. There are general paths on the world map, but by and large they tend to maze around. I found a few times when "going east" landed me on a cliff I couldn't climb down, so I'd have to meander back down until I found the way around. There is an old-school save system as well, as you can only really fully save the game at inns and such. YOu can quicksave most any time, but that's a one-off restart for when you close the game. So far in my playthrough, dying has not really hurt me, giving me the chance to flee or restart the battle rather than a full game over back to the title screen. I wish I could hard save more frequently, but I'm getting used to the forgiving way the game plays and realizing that a full save isn't as dire as I'm used to. The Alliance Alive has plenty to do for those willing to take the time to learn it. Given the variety of choices you can do to tailor your party perfectly, combined with the lack of true "leveling," you can't really just brute force your way through the game. It is a visual and aural delight, though some might miss voice acting in dramatic scenes, and I still don't understand why people who create fully 3D models don't take the time to utilize the stereoscopic 3D effect in any way, as the slider is useless on The Alliance Alive. It is a classic "thinking person"'s RPG, with an engaging story and an amazingly fun battle system for those willing to learn it. Early on, you might find a way to power through with base attacks, but you will always run across an enemy that needs a bit more skill to defeat. Overall, The Alliance Alive is a great title for the 3DS here in it's twilight years. It makes great use of the second screen, offering information and statistics for nearly every part of the game. If you've moved on to your Switch, The Alliance Alive is definitely a great reason to come back. The Alliance Alive is a welcome addition to the collection for any fan of the classic RPG system. Special thanks to FuRyu and Atlus USA for providing a copy of this excellent title for review!